First cart, Cart No. 1, was built from a steel produce cart purchased from a company called Bonus Built. I changed the wheels, mounted a different top work surface which I covered with ribbed rubber matting and used oak wood trim as a surround. I also added some hooks for cables and one drawer under the top work surface. This cart was built around 1970 and I did most of the construction at my father’s commercial company, Dove Films on Seward Street in Hollywood. Second cart, Cart No. 2, was customized by me from a cart which Ivan Kruglak designed, built and marketed from his company, Coherent Communications. Ivan designed the cart around a Sears built folding hand truck. This was actually a cart which could break down and travel flat if it had to. Once I was done with all the modifications I did to it, it really could not be collapsed. I used this cart starting in 1972 I believe. I know I used it on “Bound For Glory”, “Coming Home”, “The Brinks Job”, “Being There” and others. The third cart, Cart No. 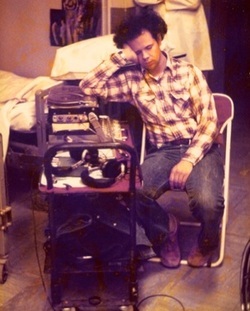 3, was the first that I built based on the design that Michael Evje had used for his sound cart. This was the first that I know of that adopted a vertical approach for a cart --- small and square footprint, series of vertical shelves (sliding to accommodate access to equipment), large rear fixed wheels and small front casters. The cart was generally moved by hiking it back on the rear wheels and pushing it around that way. The upright design proved to be a real advantage for me and I continued with that sort of design to the present day. 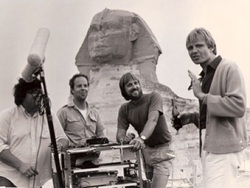 We were shooting in Cairo and the Egyptian camera truck driver crashed the truck one day --- most all of the makeshift shelves holding all the camera gear collapsed and were being partially supported by the sound cart at the far end of the truck. We tried our best to bend the aluminum back into some recognizable shape but the cart was never the same. I did continue to use it up until "8 Million Ways To Die." working on “The Natural” you can see the two fishpoles on the cart. Building Cart No. 4, 1985 in my garage, Las Flores Canyon, Malibu, California. My father used to keep some of his cars (he had about 15) at my house. During the time I was building this cart, he had his V8 Porsche there. The reason for the two frames you see is that one of them was built with the wrong aluminum alloy --- when I had the Heli-Arc welding done it got so seriously tweaked I had to do another one. equipment could all be mounted and wired up ready to work --- as soon as the cart was off the truck we were ready to work. The wrap was just as easy and fast --- no need to disconnect everything and put back in cases at wrap. The cart was designed to travel on a truck with the equipment mounted. 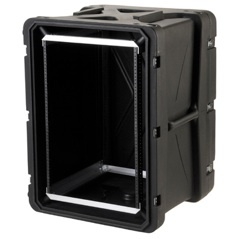 The natural design shape of the cart provided excellent protection vs. the basic Magliner-style cart with all the equipment spread out on one surface exposed to the world. I know I used this cart on “An Officer and a Gentleman” but I’m not sure when it was first built or on what picture it was first used. I think I built Cart No. 4 during “8 Million Ways to Die” which was again an upright-style cart. For this cart I put the large rear wheels inboard again which made for a narrower footprint, since the cart was more narrow to begin with, but I was never too happy with the stability of the cart when moving it. Once completed, I used this cart first on “Tin Men” in 1986. The previous cart had been anodized, but for this one I decided to go with powder coating (paint process) which was less expensive and also did not require as much dis-assembly as anodizing. I used Pyramid Powder coating and they did a great job with a light gray color for the whole cart. This cart was used from 1986 to 1994, 17 movies. Moab, Utah in 1993, working on “City Slickers II”. Michael Anderson, the Key Grip on the movie, fashioned a custom canvas cover for the cart. Cart No. 5: This was a "Case-based" cart built using a large SKB shockmounted rack case. I worked on it over the 30 nights we shot on stage (“Strange Days” was 70 nights of shooting and much of that on stage) and once completed I transferred all the equipment from the old cart to the new one. I used it for one day and hated it. Later, I gave it to Brian McCarty who used it for several years as a MUSIC PLAYBACK cart. I have considered many times building another cart built around some sort of case, I know many others have done so with good results. I am just a little hesitant since I did such a bad job on my first attempt. The new cart shared essentially the same design as all the other upright carts, but this time I made it taller, allowing for more shelves. This was to accommodate the additional equipment being used. Since having to run backup for the DAT machine, I had been running out of space on the old cart. Unfortunately, by making the cart just 5 inches taller, I found out (the hard way) that the cart would not fit upright in my Chevy Astro Van. I got a call to do a commercial in March, 2000 with Caleb Deschanel and when I started to load the equipment for the job I had to have the cart ride on its back --- it would not sit upright. Rather than change the cart, I sold the van, and I have been without a proper vehicle all these years. The first movie this new, larger cart worked on, was Billy Crystal's "*61". 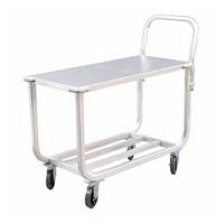 I have done 12 movies with this cart, from "Vanilla Sky" in 2000 to "Four Christmases" in 2008. Cart No. 7 codenamed JWSOUNDCART v.7.0 1.09.09, looks very much in the same tradition as carts 3,4 & 6. I wanted to get back to the size and weight of Cart No. 4 which I think was my favorite. I have in fact produced a cart which is smaller and lighter than the previous. SoundCart v.7 is 18 pounds lighter than the last cart and loaded with (less) equipment than the last cart, the overall weight should be substantially less. The majority of the weight on my fully loaded cart is the Cooper Mixer and the battery power supply. These have not changed so I still have that weight with the cart. SoundCart v.7 is 6 inches shorter than the previous cart and is fully 2 inches narrower at the widest point which is hub-to-hub on the rear wheels. This should make getting through narrow doorways easier. The biggest design change with this cart is the 2-piece construction: lower module has the wheels, large drawer and batter power supply, the upper section has all the working gear. The two sections fit together very solidly with locator pins on the 1” x 1” aluminum uprights and then bolted together with hand-twist knobs. Being in two sections this theoretically allows for transportation side by side in smaller vehicles, and then put together at the location. In practice, unfortunately, the upper section when fully loaded is just too heavy and unwieldily to be separated by one person. This can be done easily with two people but not by just one. Removing the equipment makes it possible to accomplish this with one person but that sort of defeats the purpose of quick setup of a fully loaded and functional cart when arriving at a shoot.